Mariah Balenciaga cosplaying as X-Men’s Storm, mistress of the elements. Gay Marvel comic book writer Sina Grace made waves in 2015 by re-introducing the frosty X-Man, Iceman, as a gay character. And now Grace has broken new ground by introducing what could be the series’ first-ever drag queen superhero: a fan-wielding Glamazon named Shade. 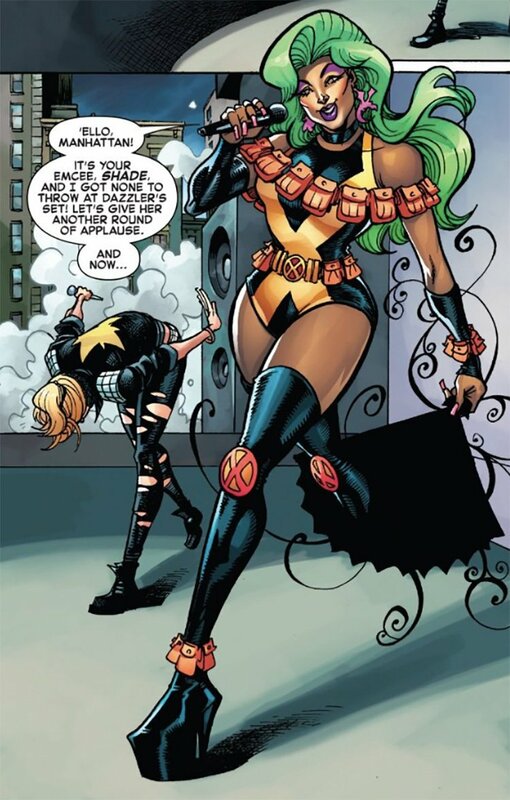 Advocate.com reports that Shade made her X-Men debut last month when she appeared in Issue #4 of Iceman. wearing a bright green wig; clunky thigh-high, platform-heeled boots; tons of tiny utility pouches; and an earring shaped like a dragon (quite possibly a nod to Lockheed, the small purple dragon cared for by the X-man Kitty Pryde). Although Shade only had a single panel in Issue #4, Grace says she’ll appear again in Issue #5 and will also appear in the X-Men’s: Winter’s End, a special issue to be released in February. Related: Who wants to see Iceman’s first gay kiss? After Grace re-imagined Iceman as gay in 2015, his standalone comic adventures were unceremoniously cancelled in December 2017 because of poor sales. Around the same time, Marvel scrapped a bunch of other standalone comic titles as well, including Generation X, Gwenpool and Hawkeye. “At the end of the day, solo X-titles are a hard sell for retailers,” Grace told fans at the time. However, Marvel resurrected the series in 2018 thanks to the successful sale of two Iceman trade paperbacks, according to Advocate.com. “I’m amazed that the series connected with an audience so much that we defied odds and got another arc,” Grace said. In August 2018, Marvel announced that Shatterstar, another openly gay superhero, would be getting his own comic miniseries. But Shade’s introduction as the first-ever X-Drag-Queen shows just how much drag culture has begun seeping into the mainstream. Has Rupaul been consulted about this? Lord Fanny was a drag queen but not sure I’d call anyone in the Invisible “superheroes”. They are the good guys, though. As for Shade, seems like it would be difficult to fight crime in those platform shoes. But her Lockheed earrings are pretty cool.